A misty rainbow disappears into Horseshoe Falls along the Niagara River in Niagara Falls. A beautiful rainbow disappears into the misty Horseshoe Falls. The colors of the rainbow soften from the mists of the falls. The falls gets its name from the curve of the horseshoe shaped crest. Horseshoe Falls is part of the Niagara River and is mostly on the Canadian side of the river. 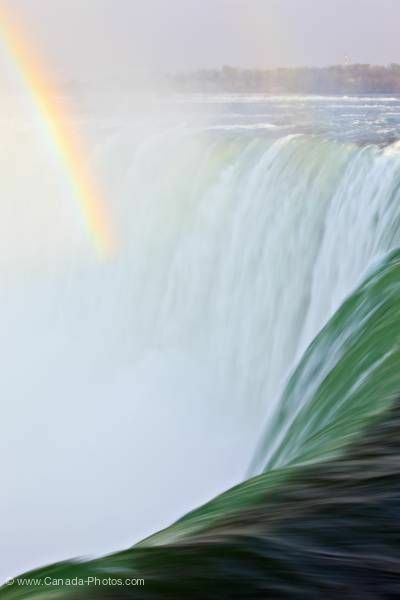 Horseshoe Falls and a rainbow in the mist above the Niagara River, Niagara Falls, Ontario, Canada.